If you are not entirely confident about riding a pony, you can have free riding lessons. These take place daily under professional supervision. You can also go on a woodland ride beyond the resort. If you do well, you get a medal afterwards. Why not compete in a riding competition like the Barrel Race: are you and your pony the fastest? Naturally, you cannot miss the Miss Pony competition. Dress yourself and your pony in the most original way possible and who knows, you may return home with a cup! Mums and dads also like playing cowboys at PonyparkCity. 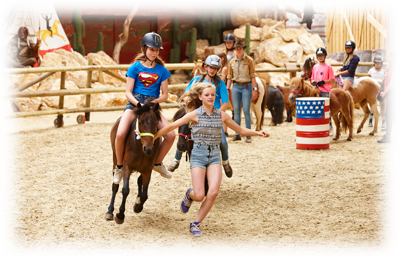 All parents can have a ride on a genuine cowboy horse! .. it’s always Lucky Town weather! In Lucky Town, the pony activities always go ahead!